When we board an aeroplane, we are often travelling not only to another place, but also to a different time. Many people have friends or relatives who live abroad, and our business contacts are often international, too. If we wish to contact someone in another time zone, we find ourselves wondering what time it is there – is it early in the morning or late at night? Will my call prove to be a nuisance, or will it come just in time? 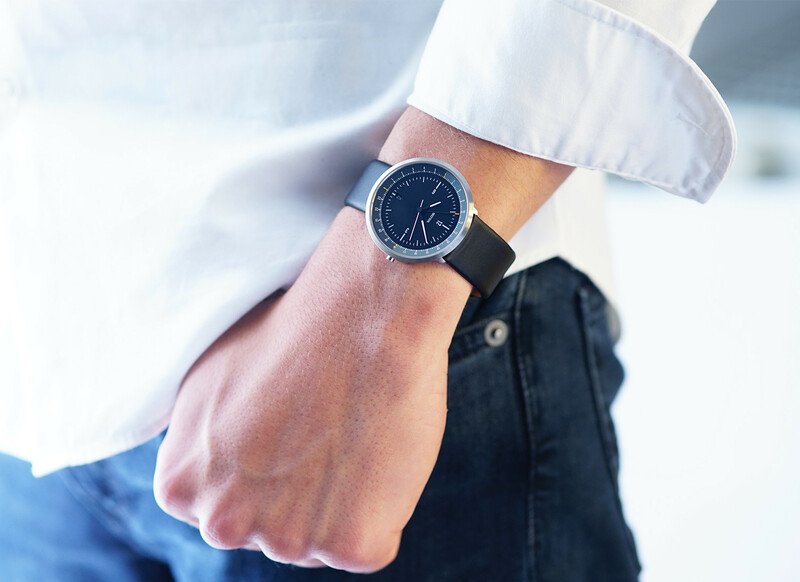 A quick glance at the MONDO dual time zone watch from Botta-Design provides the answer: it shows the local time zone in the twelve-hour format, plus another time zone of your choice in the 24-hour format. While the central twelve-hour display uses three hands, the outer 24-hour display is based on the one-hand principle.. An artificial horizon divides the 24-hour ring into a (lighter) day half and a (darker) night half. The positioning of the 24-hour display at the outermost edge of the dial gives the scale maximum resolution and makes it very easy to read. The discreet hand for the second time zone completes one full rotation every 24 hours, thereby showing clearly how far the day in another part of the world has progressed. Because the second time zone is displayed in the 24-hour format, the time there can be told quickly and easily. 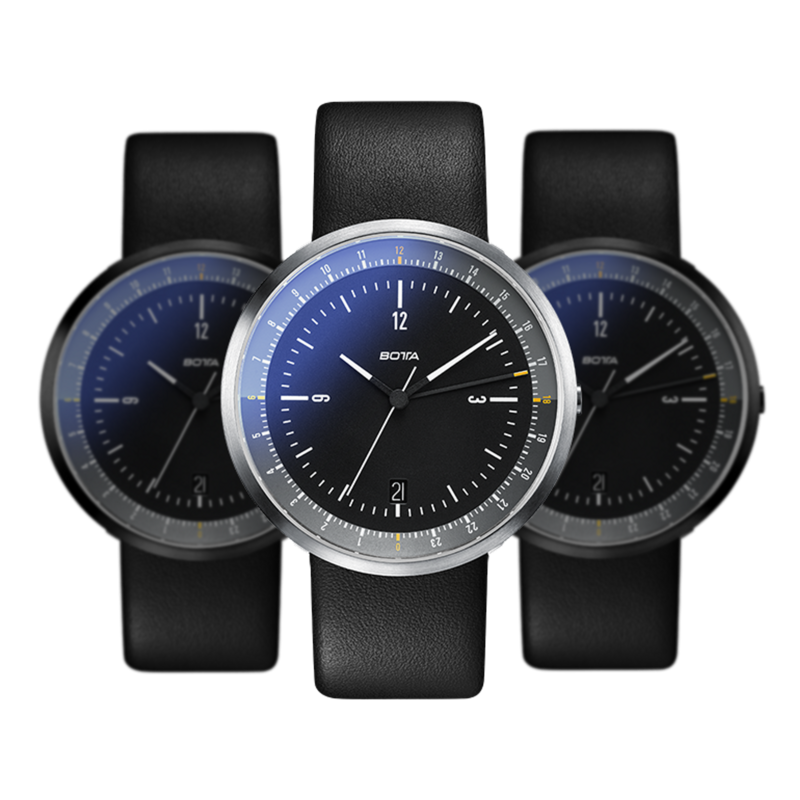 The Mondo stainless steel case comes in two different colour versions: silver (uncoated, brushed) or matt black (PVD-coated, brushed). 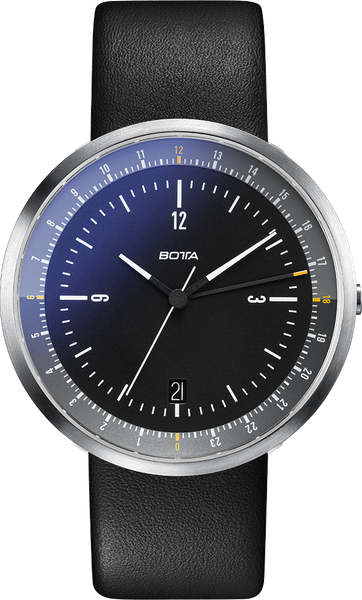 The stainless steel case of the Mondo dual time zone watch from Botta-Design has been designed to look as flat and inconspicuous as possible. Thanks to the clever use of sloping edges, it appears to be merely a flat disc on the wearer’s wrist. With its integrated lugs, the watchstrap is discreetly attached beneath the housing to save space. The entire watch case features an entirely functional design yet gives the impression of a sculpture that you will want to admire from every angle. All Mondo models are fitted with flat sapphire glass. 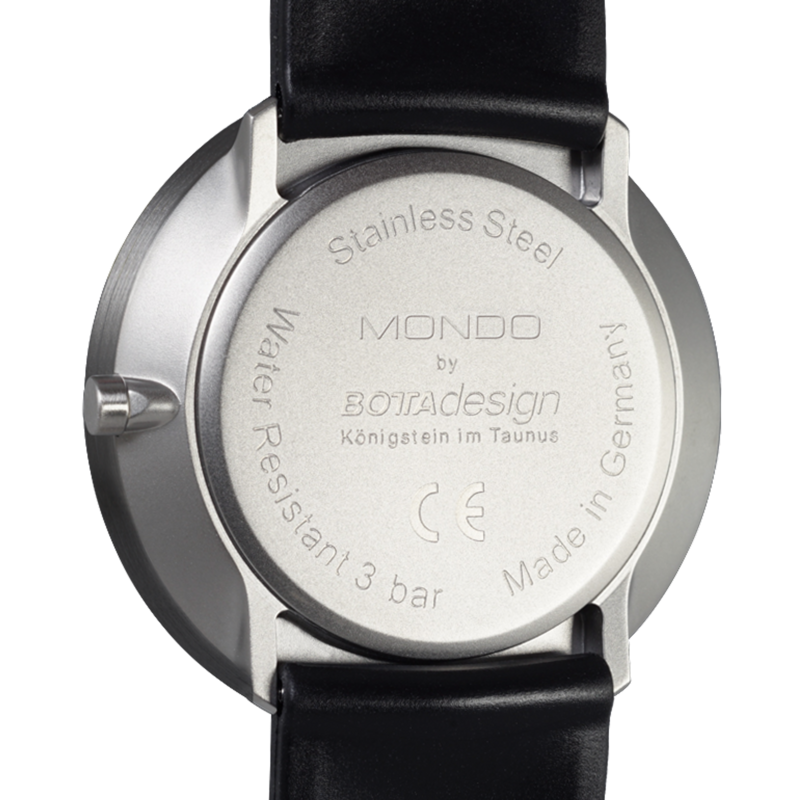 To reduce reflection and improve readability, the Mondo – like all Botta watches – is equipped with scratchproof coating on both sides. This high-tech surface treatment, familiar from high-quality optical lenses, transforms hard reflections into a transparent bluish shimmer, lending the entire watch an elegant and high grade feel. 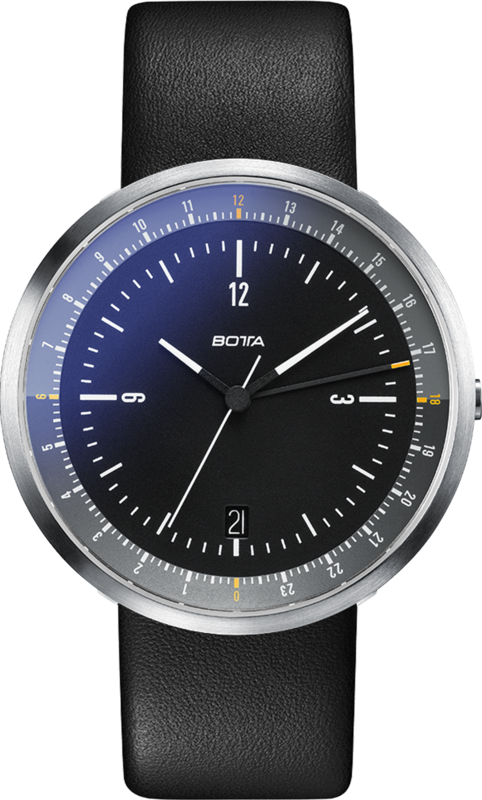 The Mondo models from Botta-Design are driven by a Swiss-made Ronda quartz movement. Unlike the much cheaper “Swiss-parts” movements, the components in this movement are manufactured and assembled entirely in Switzerland. The original Ronda movement ensures that the Mondo will run smoothly and precisely for many years, which reflects the Botta principle of technical and design durability in its German-made watches. The MONDO Black Quartz will be shipped 0. Until then, the model can be pre-ordered at a discount of € 200. Shipment will be on a first come, first served basis.